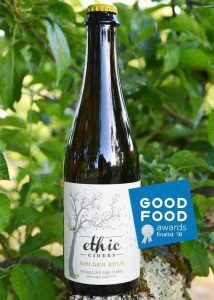 Golden Rule Cider from Ethic Cider. 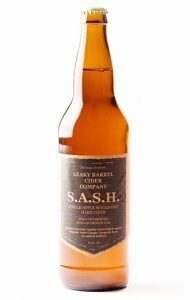 Sonoma County Cider Week is coming soon and Ellen Cavalli from Tilted Shed Ciderworks visits Brew Ha Ha today to talk about it. Also in are Ned Lawton from Ethic Ciders and Brad Yarger with Leaky Barell Cider Company. 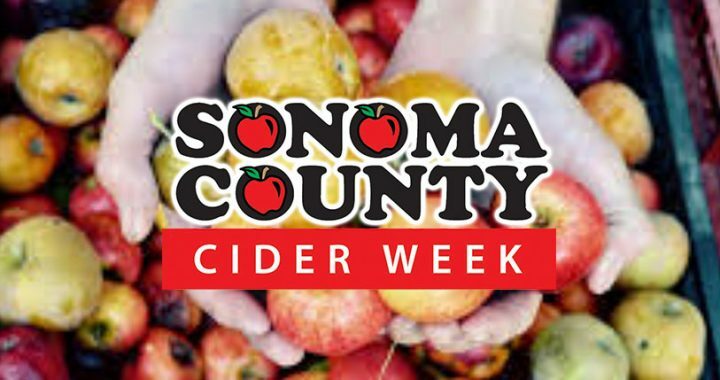 We’ll hear all about Sonoma County Cider Week, August 3-12, 10 days, 10 cideries, 100% awesome! Mark Carpenter likes to tell how he would make a science project for his kids using cider. He would take a bottle of apple cider at the store, add some yeast, put a balloon on the bottle and show the kids how the fermentation produced CO2 in the balloon. Brad talks about the apple varieties that go into his cider, including one rare one called Black Twig. Herlinda mentions that cider is taxed like wine, not beer. Even if many people think cider is sweet, not all of it is so. Ellen tells about the variety of name varieties she grows. Some apples are not for eating at all, but make great cider. It’s not always just the variety but the care that goes into the process that makes great cider. Sonoma County has a 200-year history of apple growing and Ellen Cavalli wants to invite people to taste the huge array of ciders that reflect local personality, ethos and quality of the land. There are 10 cider makers promoting Cider Week, and apart from the three in the studio today, there are Ace Cider, Agrostic, Golden State, Horse and Plow, Specific Gravity, Troy Cider and 101 Cider House Redwood Chapter. They are also staging dinners, with cider pairings. The last day of the Cider Week is the Gravenstein Apple Fair and they will be there too. Mark is happy that cider is coming back. 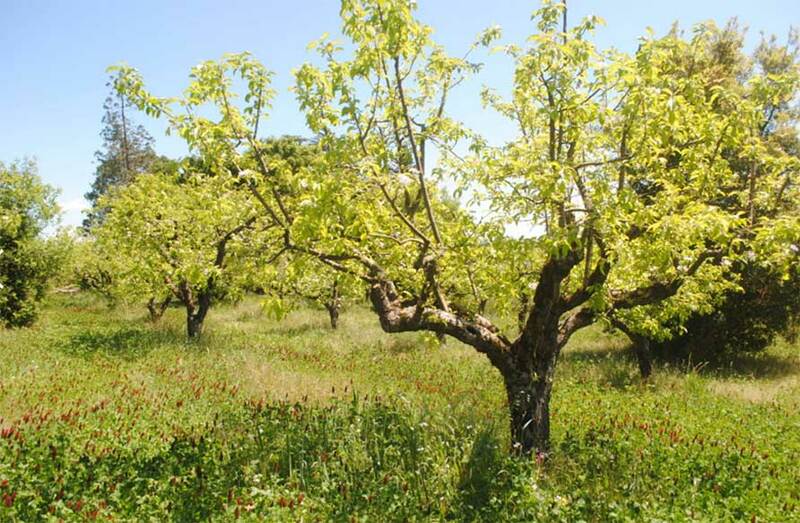 There were many apple orchards removed to plant grapes. Ned talks about how he and Brian Johnson are working on reviving orchards, even small ones of 3-5 acres. The hard parts are finding labor and finding what to do with the apples, knowing where the market is. Mark asks about the origin of Gravenstein apples and Ellen says that one theory is that the Russian fur traders in the 1800s brought them. Ned gives credit to Ellen Cavalli for organizing the Sonoma County Cider Week. Other cider producing areas in the US, such as New York state, are also having their cider weeks now. Ned talks about dry farming Golden Delicious apples. He thinks they were propagated as a grocery apple, in Ohio. Ellen says the dry farmed ones are great. Ned explains that dry farming means there is no irrigation on the trees. If trees get watered, the fruit is big and fresh but the flavors are not as strong. Mark says it gets a nice crisp clean flavor Ned notes that most ciders are blended and this one is about 80% Golden Delicious and the rest other varieties, chosen for flavor. Herlinda tastes a cider called Inclinada from Ellen Cavalli’s Tilted Shed Ciderworks. She says it is made like a Basque recipe. One is a still bottling, uncarbonated. This is 100% organic Sebastopol grown Gravensteins. It’s a wild ferment, so it uses only the natural yeast that was on the apples. It’s all nature’s work with a little help, says Ellen. She can’t show the long pour on the radio, but they pour the cider in a long stream, which aerates it and adds a little bit of heightened acidity. You’re supposed to drink it right away. One is still and the other is naturally sparkling. Ellen says they used to make fermented foods but they didn’t like cider, at first. They had apples and discovered that they liked the cider if they made it well. They found that if they put a lot of time into it, they liked the result. Herlinda mentions that Ellen Cavalli has started a cider magazine. She is an editor, professionally, and she started a Cider Zine called “Malus” which means apple in Latin. It’s all print and can’t be had on line. Ned says that they came into cider because they are foodies, so they always think of what food would go well with their product. Sliders, oysters, fish, salads, you name it. They want people to think about cider and food. Brad works for a small distributor called Half Pint Cider. He and his brother, a winemaker, have been making cider already for a while, and they just decided to take it commercial. They know people with fruit, facilities, glass, and he uses the medium of cider to express Sonoma County terroir. Mark notes that they have quite a range of flavors. The one with wild yeast has flavors like certain Belgian beers. Mark is also happy that the apples will continue to be around in Sonoma County. BONUS LINK: Sonoma Magazine article: Local Taste: Best Places to Sip Cider in Sebastopol. A Sonoma County apple orchard.